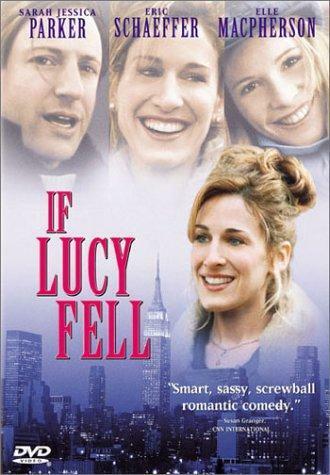 The other day I was re-watching an old favourite movie of mine called If Lucy Fell. It's a movie about 2 friends who form a death-pact that they will jump off the Brooklyn bridge on one character's 30th birthday if they are both still single. Sounds like a delightful comedy, right? It's quirky and endearing, not a cinematic masterpiece, but worth a watch. If was made in 1996 (you could probably guess that almost to the exact year when you watch it and see the clothes, lol) and it stars Sarah Jessica Parker. Look for Ben Stiller (with long dredlocks!) and a very young Scarlett Johansson. 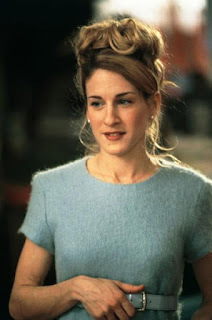 On viewing this again I remembered how much I really liked the way SJP's character wears her hair for most of this movie - a big, giant even, messy bun right on the top of her head. 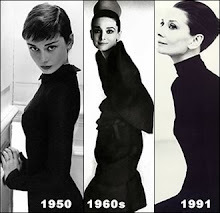 So, with this as my inspiration I decided today I would rock the giant bun. Since my hair is naturally straight with very little volume my bun is a little sleeker, also since I was going to be at work I wanted it to look a little less messy. don't have a hair doughnut? never heard of a hair doughnut? grab a sock instead. seriously. just make sure it's clean and doesn't have a mate. et voila! use a big, thick gym sock if you want a really big bun. This is a normal sock and it yields a decent size bun. So, you've got the sock/doughnut on your ponytail. Wrap the ends around the doughnut and then start to roll it down to the base of your ponytail. As you roll it down the hair wraps itself around the doughnut and you can adjust it as you wrap so that the sock is entirely covered by your hair. Once your bun is done it stays put all by itself. You don't need any bobby pins or clips at all! Need a more modern inspiration than 1996 Sarah Jessica Parker? 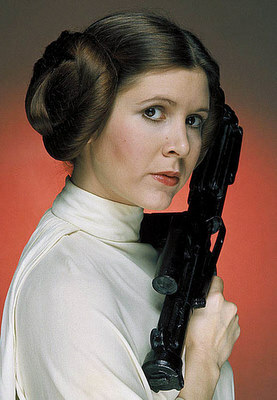 Wanna be Princess Leia for Halloween? Just cut up the other sock and do one at each ear! Well, you learn something new every day. Netflix? I have the DVD...or wait, maybe it's on VHS...either way, you can borrow it if you don't find it on netflix. I never saw that movie…maybe it's because I really dislike Sarah Jessica Parker. And her giant fur coat. I used to wear my hair like that, torturing my head with pins for hours. Now I have shorter hair, what a freedom! I just decided to let my hair grow again. I'm fickle. I'm trying to learn how to take care of my hair. For years, I fought my natural waves/curls, so now I'm trying to learn to care for them properly and make the most of them. I don't know if it will make a difference or not, but I'm going to try. The bun looks great on you! I'm going to try and add the movie to my Netflix list. Oh my! You really are quite ingenuous! Good grief. Sorry, I meant ingenious. What a difference one vowel can make!